It feels like I haven’t given a YUMMY AWARD! in AGES! And the truth it that it has been six months, so I am well over due! This one was especially fun to write because the minute I put my hands on this book I had lots of lesson ideas. I’m always looking for books that lend themselves to the development of music literacy. I especially like books that provide a variety of uses for the same book. Often these books will work with multiple grade levels depended on the simplicity or complexity of my ideas. In any case, I found this book at TMEA and I’ve been looking forward to incorporating into my bag of tricks! I could post several known rhythms like and then ask the students figure out where in the page those rhythms happen. 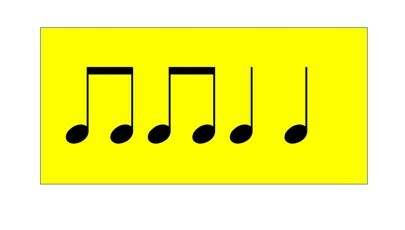 Wouldn’t it be fun to have students write a rhythm we were working with on a small post it note and then place it in the places when that rhythm happens? I think they would love it! We could extend our work by orchestrating our book for various instruments. Each page is composed around a different hard consonant sound. Perhaps the “Ch” sound could be played on the sand blocks while the hard “k” sound was played on the woodblock. The possibilities are endless! Wouldn’t this be a fun way to approach rhythm dictation? If students were well versed in rhythmic patterns they might enjoy the challenge of figuring out the rhythmic pattern. It’s a new twist on the “what rhythm am I playing?” game. Students attempting this would need lots of aural discrimination practice under their belt, but I think that they could puzzle it out. An extra challenge might be for older children to compose another page for the book. I think this would be an excellent opportunity to create a class book filled with original compositions that we could then play and orchestrate. What about melody?!!! This book has such a wonderful rhythmic pattern that it might be the perfect opportunity to ask older students to take known pitches and compose an original melody. Imagine this book played as an original composition!!!! MY! MY! MY! – This is starting to sound like an entire semester worth of study and it’s just 1 book! – LOVE IT! Want to see what other books have received a YUMMY Award? Click HERE! You make me smile. I love music, not a music educator AND I can appreciate what you do. Do you have any easy to follow sight reading suggestions? My sophomore in high school daughter needs this for an audition in October… anything helps! I love Ultimate Blog Challenge. I meet such interesting people! Wow! super cool. am sure if books like these can be included for little children's aids it would do them great good. Some great tips for younger and older children here. Nice one!